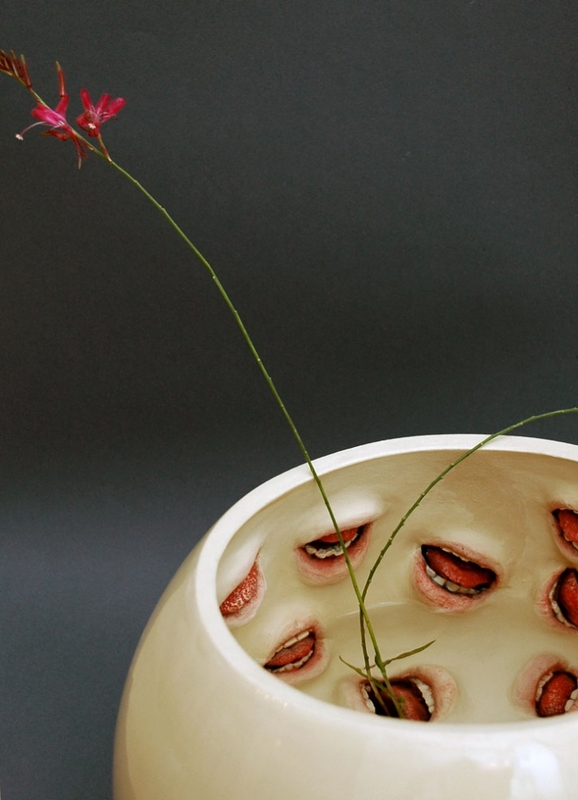 Yes, we already had set our eye on the fabulous work of Ronit Baranga; as some of you may remember, we fell in love with her hybrid tea set for the “dining in 2015” competition of designboom (one of our favorite honorable mentions). 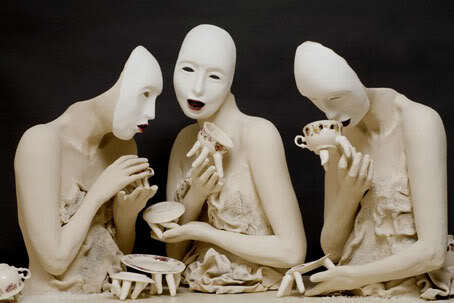 We promised then to keep an eye on this talented Israeli sculptor and the time has finally come to keep our promise. Baranga may have studied Psychology and Hebrew Literature but art finally was meant to be her true vocation. After finishing University she began her Art studies at Bet Berl College and continued at Yael Shkedi’s silver and gold craft school. Since then she hasn’t stopped creating some of the most beautiful sculptures we have ever seen. What captures more the attention of the viewer is the enchanted atmosphere that surrounds her creations, that “special something” hard to define. Hands and mouths appear where least expected, threads that look like spider nests give you the impression of having found some forgotten treasures, bracelets suffocate their victims and at the same time want to set them free and everyday objects seem almost alive. What more could we ask for? Ronit certainly has a very vivid imagination and although she flirts with the extremes, her sculptures still have an earthy charm. One of her latest creations is her anthropomorphic Vase that seems to be hungry for water. The idea, as Ronit explains, is that the vase has a symbiotic relationship with the flowers. The flowers are feeding from the water in the vase, and thanks to that it is recognized as a vase (and not as a bowl, for example). The result is quite stunning, open to interpretations and unconscious associations since you don’t know if the mouths are vegetarian or could even eat your hands! We continue with Baranga’s special Necklace, a sculpture which deals with the border between the body and the space around it. 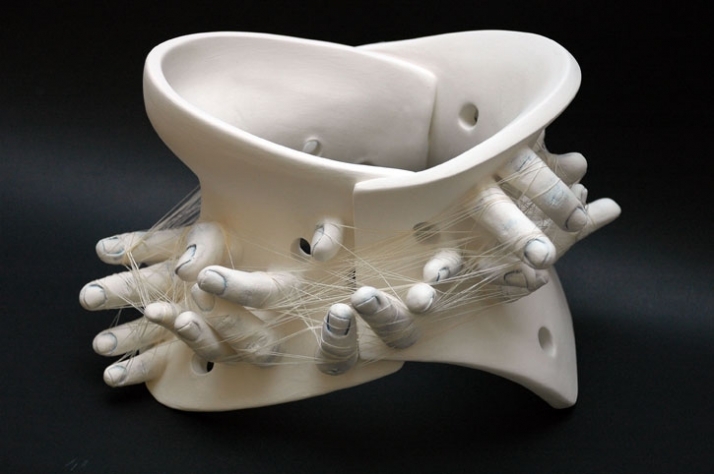 As Ronit explains, the brace restricts the body, but at the same time reaches out to touch its surrounding. We are pretty sure that for some of us could even symbolize this eternal fight between freedom and security that we encounter in every relationship. The sculpture is now exhibited in the “Eretz Israel Museum, Tel Aviv, Israel”, as part of the 5th Israeli Jewelry Biennale “Sequences/Identities”. Last, but not least, Ronit’s strikes our attention with her amazing Amulet. She was inspired by the little perfume bottles which were used as amulets in ancient time and made rings based on their shapes. 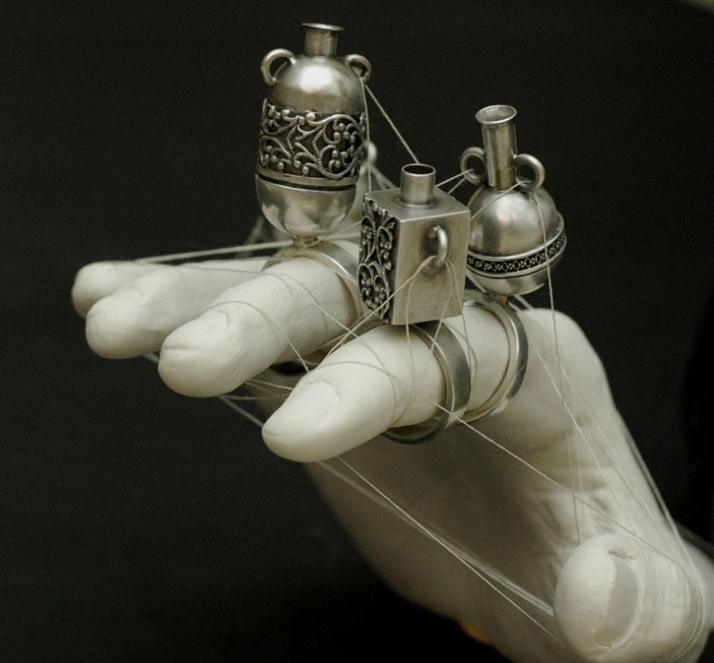 The rings are connected to each other with a thread that ties the hand which wears them. Ronit definitely has the ability to surprise us with her vivid work that questions the limits of the beautiful and proves that not everything is done and seen in the art world.